If you are fed up of the hype and commercialisation of Easter, turn the tables and do something different that will make a real difference. Children on average receive 8.8 chocolate Easter eggs each year. That’s a lot of chocolate, a lot of sugar and a lot of calories for them to burn off. 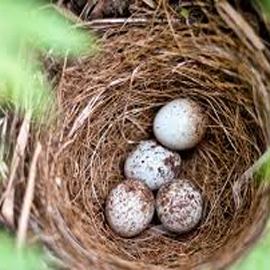 So instead of buying chocolate eggs this Easter why not support the garden birds instead, as they hatch their eggs and rear their own little chicks? By getting the kids a bird feeder and some bird food, you will get true value in return. For not only will your whole family become quickly enthralled by the birds in your garden, but it will encourage your little ones outside and generate conversations about wildlife, nature and of course the birds and the bees. 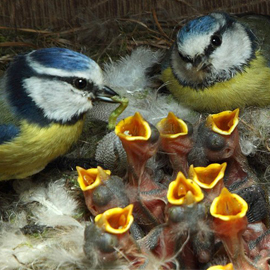 By supporting the birds at nesting season, you are ensuring the survival of the next generation of Easter chicks. 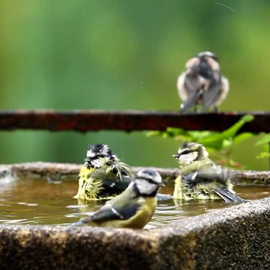 By keeping the birds around your garden, you can watch and enjoy their family as they grow. Feeding the garden birds is a fantastic way to engage with wildlife. The survival of these fragile creatures can hang on a thread, so a well-stocked feeding station can make all the difference and it adds a wonderful feature to the garden. As the birds flock to the feeder to eat, their lively antics and acrobatics are extremely entertaining. Think of it as providing a food bank for the birds. Instead of buying Easter eggs, your money is being well spent supporting the local birds at a critical time in their life. Nesting season is a tough time for the birds as they incubate their eggs and search for food. Make it easy for them with a steady supply of quality bird food and they will repay you by keeping your garden pests under control. Birds need to drink and a fresh supply of clean water is essential especially in the breeding season. Give them a water bath and enjoy watching them take a dip. When their chicks are fledgling you could be really lucky to see them join their parents for a daily bath. Get a bird guide to help the children to identify some of the garden birds. Make it into a real live game like a living Pokémon Go. Award the children points for correctly identifying new birds and offer a prize for the most spotted birds. Take photos of the birds with the kids and help them to get to know them, give them names and keep a bird-spotting notebook to jot down when you see them. Feeding the birds is not just for the kids. It’s perfect for anyone that spends time alone, as simply watching the birds can really lift your spirits. For some people, these little creatures can become almost companions or wild friends. It’s nice to feel needed and feeding the birds is an easy way to give a fresh, simple, positive perspective on life.